With basically the same ingredients and cooking technique, samfaina usually gets tagged as Spanish ratatouille. But Catalonians would argue that their neighbors to the north are really just making French samfaina. We can leave the wrangling to the nationalist gastronomes and just be happy it's the time of year when all of the produce used in making this summery dish are abundant and delicious. Start by chopping the onion and cooking long and slow in plenty of extra virgin olive oil. While the onion is getting soft and golden brown, cut your tomatoes in half (across their "equator" so the stem end is on one half). Most recipes, including Pinotxo's, tell you squeeze out the seeds, but the seeds and their surrounding "jelly" contain most of the umami-rich glutamtes, so leave them in. 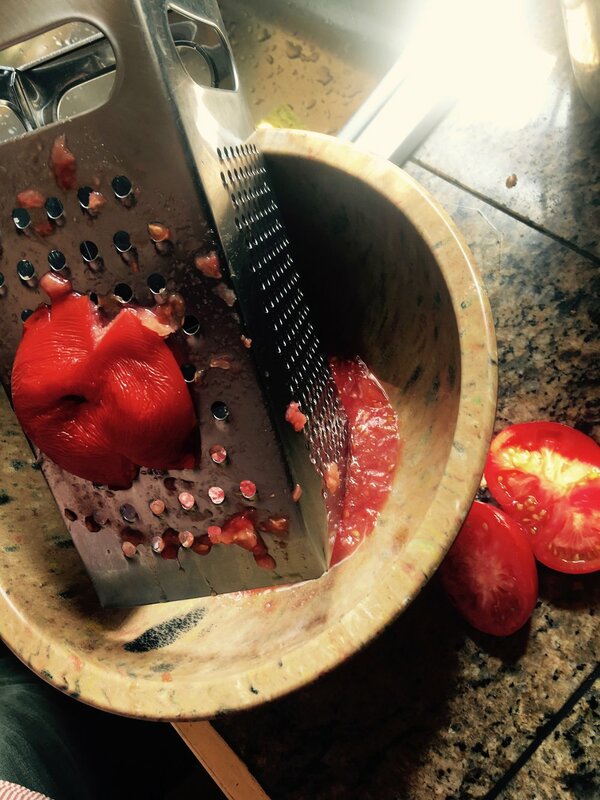 Rub the cut tomatoes gently across the large holes of a box grater (over a bowl, natch) until all that's left is the peel. Add the grated tomato to the onions with some salt and cook for about 15 minutes (or longer) until they've thickened. Cut the eggplant, zucchini, garlic, and pepper into small pieces and add. Cook over low heat for at least an hour (or, if you have time, put the skillet in the oven at 200F for a few hours, checking and stirring every once in awhile). In the end you want a thick, jam-like sauce. You can eat samfaina by itself, spread it on grilled bread, set a piece of fish on it, spoon it over chicken, or stir it into a bowl of garbanzos. It tastes like slow-cooked summer. Real Good Food sells extra virgin olive oil from small producers in Italy and California, hand harvested sea salts from Portugal & italy, Orleans method and traditional balsamic vinegars, heirloom grains and beans from West Coast farmers, and other good things that make life delicious.